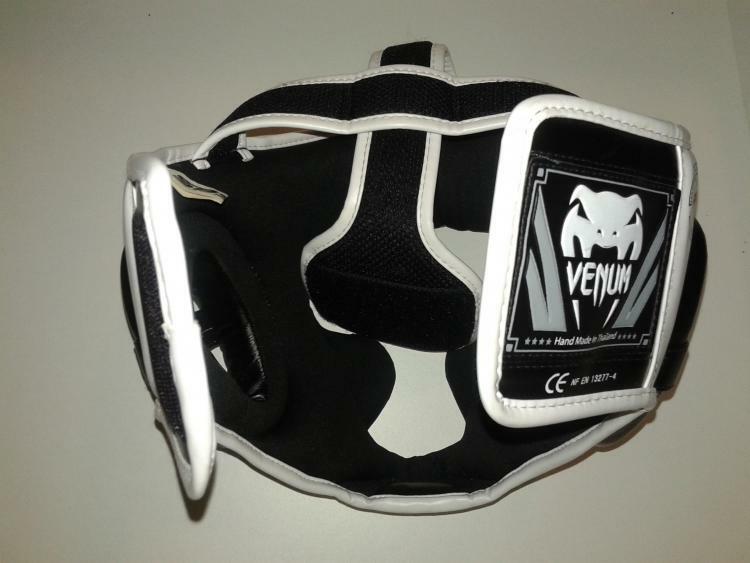 A combat sports company named Venum has developed a protective headgear called the Venum Challenger 2.0. The following content will review this full face training headgear. Physical Appearance: The following image display the different design options available for this Challenger headgear. Material: The exterior of the headgear is composed of high quality synthetic leather. The interior is made from a soft fabric material. Full Face Design: For its full face design, the Challenger has cheeks and chin protectors for cushioning impacts. 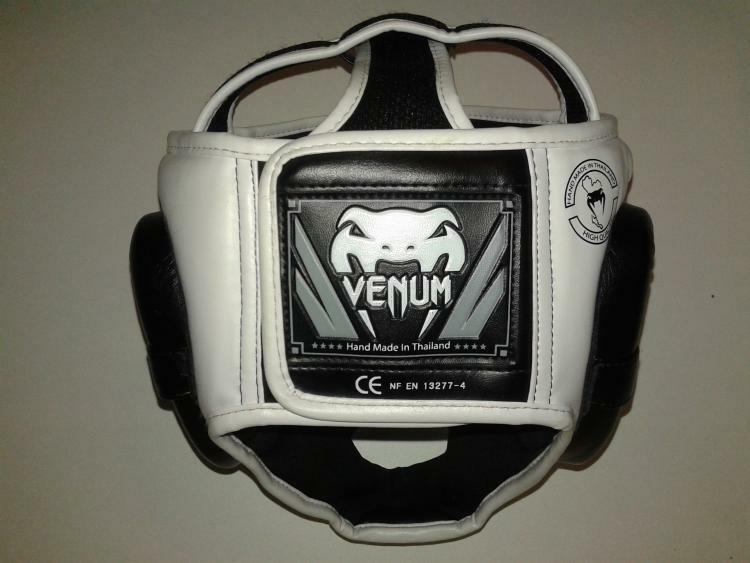 Padding: Venum developed the Challenger headgear to have layered foam padding at specific parts for improved impact absorption. 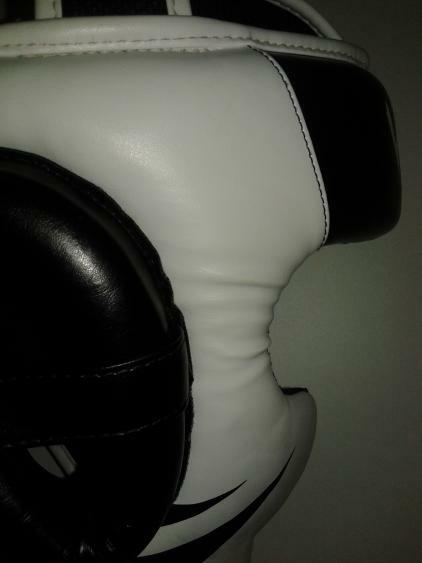 While the cheek and chin protectors have a single layer of hard foam, the rest of the headgear has a hard foam layer and another layer of softer padding on the interior. Ear Padding: A thick foam padding sits over each ear. Adjustable Velcro Straps: The Challenger uses a unique Velcro design that allows individuals to quickly remove or put on this headgear. The image below shows the steps needed to secure the headgear to your head. This is a view of the headgear Velcro all being peeled apart. Attaching the first two layers. Connecting the last layer needed. The Challenger is a lightweight headgear that is comfortable to use in training and sparring sessions. I am a huge fan of the Velcro straps design since they are convenient and allows the Challenger to be worn without assistance. I did not have a problem with needing to adjust it mid-round. The headgear’s interior fabric is nice and soft. One downside to this fabric is that it tends to absorb and cling onto your sweat unlike the ones with the leather interior. Even after cleaning the Challenger surfaces and leaving it out of the gym bag for air circulation, it is hard to dry out all the moisture. Therefore a funky odor slowly builds up over time. On the other hand, the soft fabric feels like it grips better once you start getting sweaty. The ear padding is made from the same dense foam as the headgear’s outer layer and is able to cover my ears. I do notice a decent size distance between the bottom of my ear lobe and the ear padding below it, therefore I wish the ear section would have been designed to be a bit more towards the top of the headgear. Doing so would let my ear sit more comfortably in the middle of the padding. My only other complaint would be how the cheek protectors do not fit snug to my face. If it had the extra soft padding layer like the rest of headgear, instead of one layer of dense padding, it would probably fit flushed against my face better. That said, the gap was not an issue during sparring. The Challenger’s fantastic construction adds to the appeal already provided by its unique design, cool color options and clean look. This Challenger headgear has multiple logo and company name placements, but they look good to me instead of being tacky. For the most part, the headgear is still in great shape. The stitching quality is excellent. Each Velcro sections are still sticky and tough. I noticed that creases in the synthetic leather are developing over time. These creases are visible on the edges of the eye slot, as shown in the image below. The creases affects the Challenger’s physical appearance and not its performance. 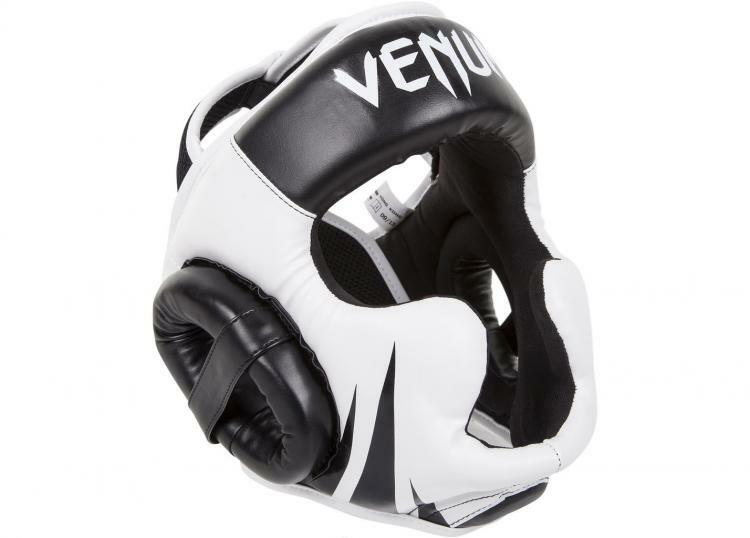 I have used the Venum Challenger headgear for boxing, kickboxing and MMA sparring sessions. It provides me great protection. 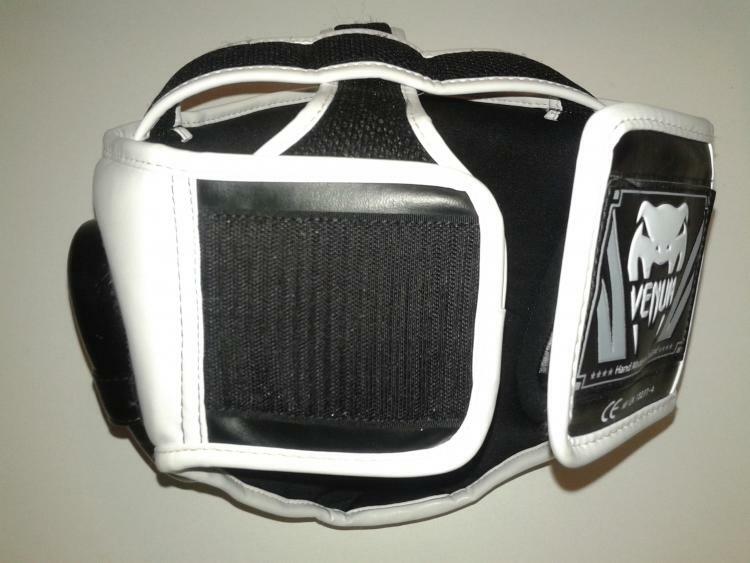 The soft foam padding complementing the dense outer padding is a great feature for softening the blows to the head. The visibility on this headgear is fantastic. The edge of the eye slot does not compromise my peripheral vision. The cheek protector for the Challenger also has a lower profile than other full face headgear I have worn. Of course, the cheek protector still do partially impede your vision. However, this feature enhances the overall sight line while allowing the Challenger to retain its protective attributes. The bridge of the bar is slightly in view as you keep your chin down and look up towards your opponent. However, it does not not overly impede my vision. The Challenger’s chin protector is a nice addition. Moreover, it is a great alternative to chin straps that can dig into the bottom of your jaw, especially in clinching and infighting situations. A thing to note is that the Challenger has no padding dedicated to the back portion of the headgear. The only protective measure is the three layers of velcro securing the headgear. The top of the line boxing headgears like the Winning FG-2900 can be quite pricey. 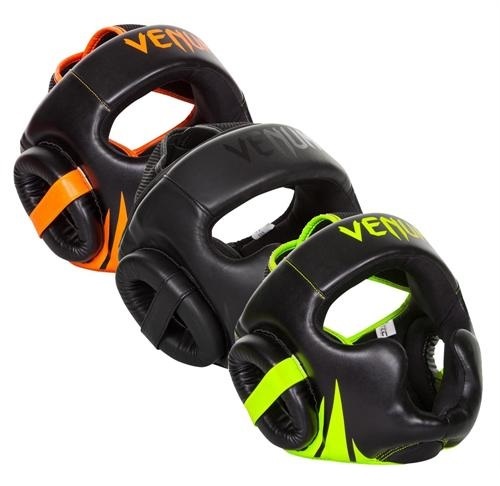 I would recommend the Venum Challenger 2.0 headgear to beginner and intermediate level strikers that want a quality headgear without breaking the bank. Should You Wear Headgear When Sparring?